Wrightsville Beach, N.C. – It ends with a bang! 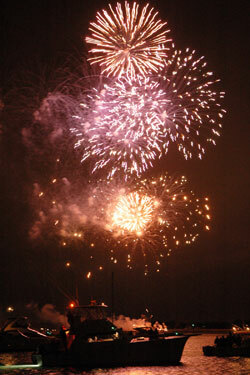 A grand finale of fireworks illuminates the seacoast harbor at the conclusion of a three-day Thanksgiving Weekend tradition as the North Carolina Holiday Flotilla parades into home port. 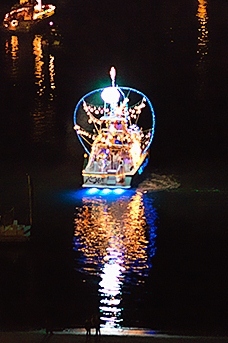 From the arrival of Santa and a quaint town tree lighting ceremony to a magical floating boat parade, the 28th Annual NC Holiday Flotilla offers something for all generations. Tykes and toddlers will want to be beneath the Town Hall tree for the official lighting and the arrival of Santa and Mrs. Claus at 5:45 p.m. on Friday, Nov. 25. Boat captains, crew members, sponsors, and partygoers will gather later for the official Anchors Away launch party at the host hotel and reviewing stand, the Blockade Runner Beach Resort at 7 p.m. The Central Park Band will kick off the celebration; admission is $35 per person and includes the Blockade Runner’s award-winning fare. The famed Festival in the Park features a shopping emporium of fine handcrafts, suitable for holiday gift giving, outdoor children’s games–a climbing wall and The Arab Choo Choo–and an antique car show, among other novelties, staged at Wrightsville Beach Park. Admission is free from 10 a.m. to 4 p.m. on Saturday, Nov. 26. With $7,500 in cash prizes–$5,000 for the Best in Show winner–and an increased number of divisions for powerboats, the lighted boat parade should attract even more captains this year than last. The spectacle can be viewed all the way from Bradley Creek to the Intracoastal Waterway, and Motts Channel to Banks Channel, before ending at the U.S. Coast Guard Station Wrightsville Beach. And then there are the spectacular fireworks with the best vantage point from the waterways where thousands of spectators line piers, docks, bridges and channel banks. Rival boat captains and crew members must wait until winners are announced at a special brunch hosted by the Blockade Runner Beach Resort on Sunday, Nov. 26. Giving and receiving is the hallmark of the North Carolina Holiday Flotilla. Its board of directors sponsors a 5k fun run and walk on Saturday, Nov. 12 and opens its headquarters three days a week before, during and after the festival for the purchase of Anchors Away tickets, 5k or boat parade registrations and swag sales. With ball caps, T-shirts, sweats and commemorative boat bags and tree ornaments, the proceeds go back into the organization that spends a year planning the biggest free public party in Wrightsville Beach, home port of the North Carolina Holiday Flotilla, consistently named one of the Top 20 “Must See Events in the Southeast” by the Southeastern Tourism Society.